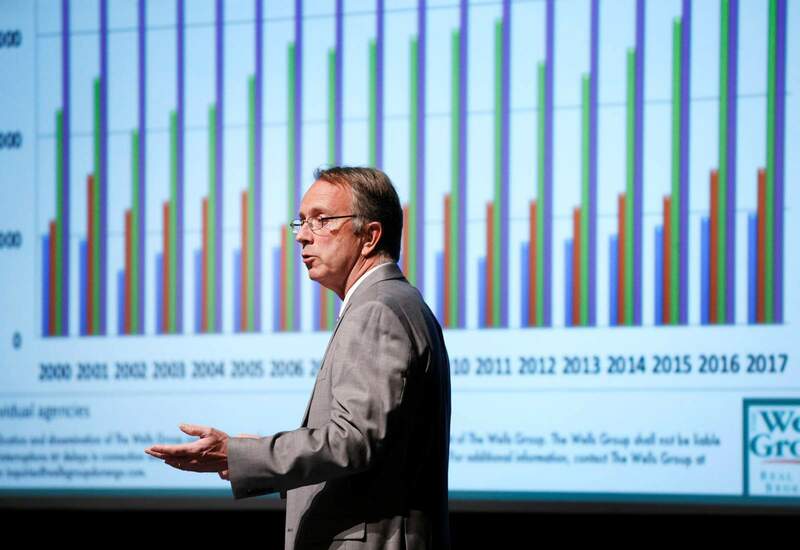 Bob Allen, real estate appraiser and consultant with Allen & Associates, talks about some of the area real estate numbers Tuesday night during the 18th annual Wells Group forecast held at the Community Concert Hall at Fort Lewis College. Bob Allen, real estate appraiser and consultant with Allen & Associates, left, John Wells, center, broker-owner of The Wells Group, and Jim Wotkyns, broker-owner of The Wells Group, listen to a recorded statement from Christi Zeller, executive director of the Energy Council on area gas and oil production on Tuesday night during the 18th annual Wells Group forecast held at the Community Concert Hall at Fort Lewis College. 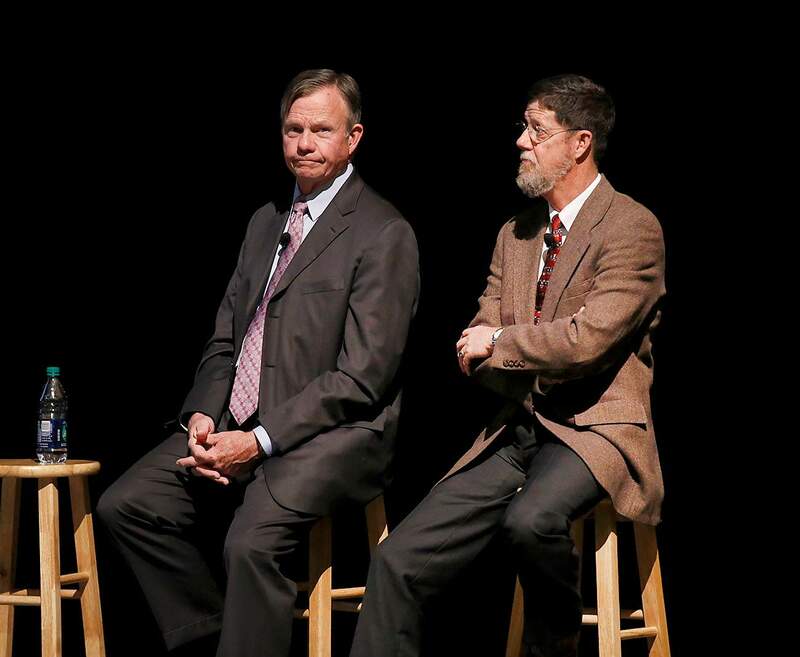 John Wells, left, and Jim Wotkyns, broker-owners of The Wells Group, wait to make their presentations on Tuesday night during the 18th annual Wells Group forecast held at the Community Concert Hall at Fort Lewis College. John Wells, broker-owner of The Wells Group, said he expects the steady improvement in the residential real estate market to extend into 2018 despite increased homebuilding costs and higher mortgage rates. A rebound in home sales from the Great Recession in 2008 is expected to extend into 2018, with the lure of the San Juan Mountains expected to attract more baby boomer retirees, outdoor-loving millennials and big-city residents looking to better their quality of life. The area’s draws, said John Wells, broker-owner of The Wells Group, and Bob Allen, real estate appraiser and consultant with Allen & Associates, are likely to prove stronger than some market headwinds developing – especially rising building costs and increasing mortgage rates in 2018. 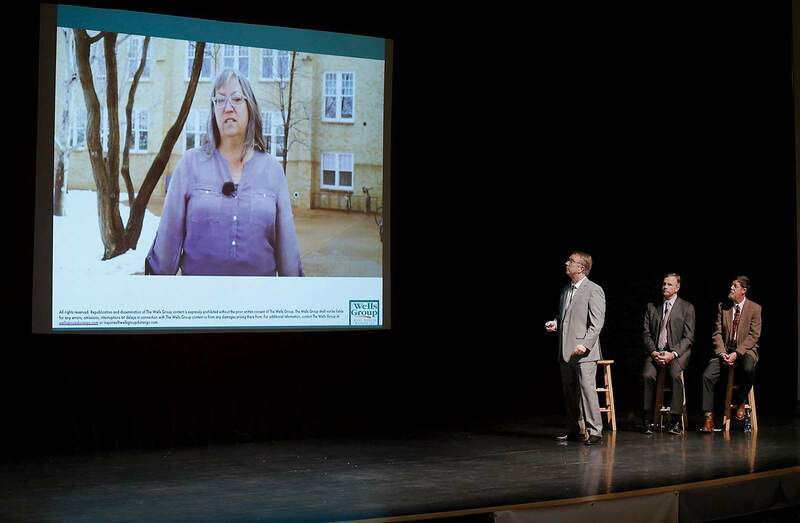 A forecast for the real estate market came Tuesday night at the 18th annual Wells Group forecast held at the Community Concert Hall at Fort Lewis College. “Homebuilders are having a tough time finding guys to swing the hammers. I think construction costs are going to have to go up,” Allen said. He noted mortgage rates have increased 10 percent since January 2016. “That’s really going to impact affordability,” Allen said. Lumber prices, he said, are at an all-time high. Also, he expected steel and aluminum tariffs proposed by the Trump administration to fuel increased costs for homebuilders. “I think some buyers are in for a price shock,” he said. Wells, who made 10 predictions for the real estate market, topped the list with revisions to the La Plata County land-use code. He said almost everyone agrees the code needs improvement from the much-panned draft released in December 2017. “We all have to contribute to the development of the code, so what we end up with in October or November is something we all can live with and will enhance life for everyone in La Plata County,” he said. Despite the lack of snow, Wells expected a good year for tourism in La Plata County – saying Durango’s place on the national parks loop in the Four Corners plays a particularly valuable role in supporting demand for housing in the county. He noted the sales tax collections in Durango for recreation and amusement spending increased 30 percent in 2017 compared with 2016. Allen noted the median price level of Durango homes has plateaued around $425,000, for about a year. He also noted days on the market for Durango homes in 2017 was about four months, which he said is a relatively brief time by industry standards. In Bayfield, Allen said a lack of available homes on the market may pinch home sales in 2018. In total, all real estate transactions in La Plata County, which include vacant land sales and commercial permits as well as residential permits, increased by 9 percent in 2017 compared with 2016. But residential permits in particular had a fairly spectacular increase of 90 percent in 2017, a number largely driven by a 220 percent increase in multi-family permits. 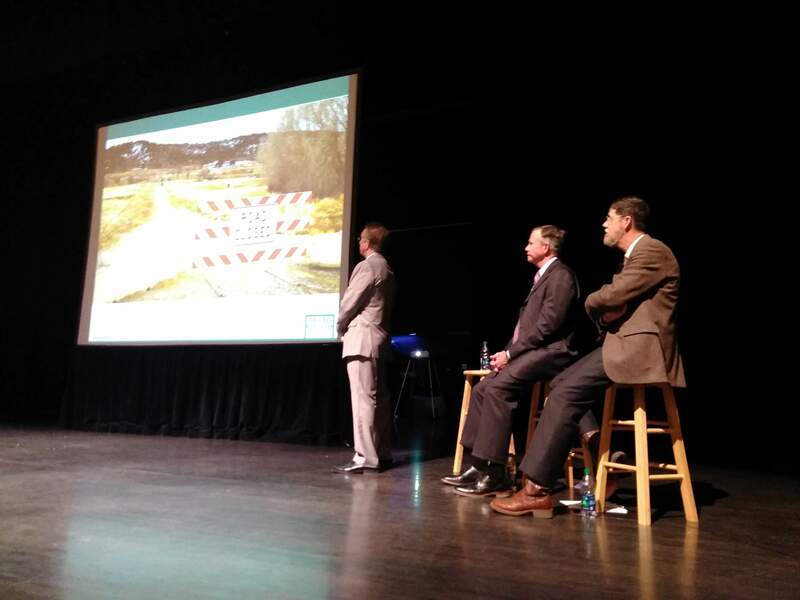 Development of apartments in Three Springs is a good portion of the increase, Allen said. Residential permits include permits for single-family homes, multi-family homes, duplexes and townhomes. Some 50 homes a year are selling in Three Springs, Allen said, noting it is the focus of attainable and first-time buyer housing in the county at an average price of around $400,000. In looking at the rental market, Allen said he believes the state’s rate of 3 percent vacancies for rentals is high. He thinks a more accurate number is around 2.5 percent, but he expects the vacancy rate to increase as apartments in Three Springs come online. Wells offered an interesting prediction for Dryside residents. He said he expected development of a water system to provide a reliable domestic water source to the Dryside to drive up the area’s home values. A similar dynamic, he said, would be in play in southeast La Plata County and Archuleta County as the La Plata Archuleta Water District increasingly provides reliable domestic water.